Shirdi Sai Baba devotee Srinandhini Shivakumar from India says: Om Sairam! Dear Sai devotees, my name is Srinandhini and I am blessed to share yet another leela of this ever-loving Deva, our Sai. I wear a small diamond nose-pin on a daily basis. On the day of the lunar eclipse - 31st Jan 2018, my nose-pin somehow got loose and fell into the washbasin while I was blowing my nose on waking up in the morning. Only the screw was in my hand. My heart literally stopped and I got terrified. This had never happened before, and also it is inauspicious to lose jewellery when talks of auspicious functions have started at home. My family members sprang into action, trying to open and remove the pipe etc. I couldn't think straight in the panic. All kinds of thoughts rushed into my mind. All I knew was my saviour, Sai should save me. I went to another part of the house and continued my morning rituals while desperately praying to Baba and I totally surrendered to Him. I had no idea whether it would be possible to retrieve it as it was really small and I humbly asked Baba to show the way and do what He thinks is best. Suddenly I heard mom screaming "Found it!!" I went over and saw to my delight, the nose-pin sitting in her palm. She told me initially they couldn't find it but then after shining a torch, it glittered and showed itself up. Thank You Baba, thank You so much!! It is only due to Your grace that it was found again. Baba, You are the torchlight in our lives, guiding and showing us the way. That day, I was allotted chapter 49 as part of 365-parayan - I was stunned to read the similar experience of Hari Khanoba and Baba returning his lost slippers. Thank You Baba, for all Your blessings and love! Without Your grace, nothing is possible. With Your grace, anything is possible. So true and beautiful Srinandhini ji that with Baba’s grace anything is possible however big or small it is but not bigger than our Deva; else what are the chances of anything big enough too flowing down through the pipe along with the flow of water to be found back again. It was purely with Baba’s grace only that He got back the flowed away nose pin and same was experienced by you too by reading Sai Satcharitra’s allotted chapter for that day. Amazing is our Deva and unfathomable are His Leelas. Love You Saimaa. Please never ever let us be ever able to leave Your hand for You holding it with a firm grip. Jai Ho Sai. Shirdi Sai Baba devotee Hetal Mashru from India says: Om Sai Ram, It was on a lunar eclipse day.I had decided to show the moon to my tution students through the binoculars. The binocular was very special as it was bought by my father-in-law 35 years back and he loved it very much.We all went to terrace to see the moon and at last I realised that my main binoculars were missing. I was in tears and I enquired about it to all my students but nobody confessed about stealing it.I was very sure that somebody took it deliberately. It was then I asked Sai to return it back to me. My kind hearted Sai Baba gave it back to me.Yes !!! After reading Sai Satcharitra and reporting on group on Thursday one of the students confessed about stealing and gave it back to me. I thank You Sai not just for giving me my binoculars back but also for the guidance of right way to my student. Sai Satcharitra The Illuminator Of Our Inner Beacon Light Which If Read Daily, Safely Directs Us To The Emotional Tranquility Within Us And Thus Saving Us From Turbulent Emotions. 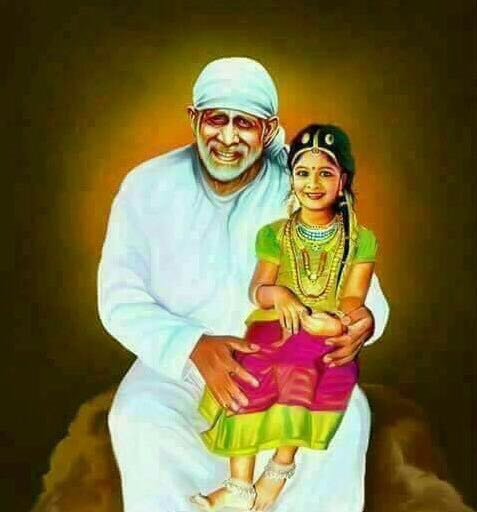 Thank You Sai for giving us the nectar in form of Sai Satcharitra. Love You loads. Jai Ho Sai. Shirdi Sai Baba devotee Sarika Anchan from UAE says: Sainath Maharaj Ki Jai. Before I share my experience I would like to tell all the Sai devotees who still have the slightest doubt in their minds, if Baba is really around us and is listening to our prayers, let me assure you all that, yes He is very much near us and time and again He is proving it. I used to read Sai Satcharitra since I was working and had continued it even after my marriage. But lot of unfortunate incidents kept coming my way and I used to be very disturbed. Finally I gave up the practise of reading the book every Thursdays because I felt I was not doing justice to that book while I was always disturbed and had lost faith in God. 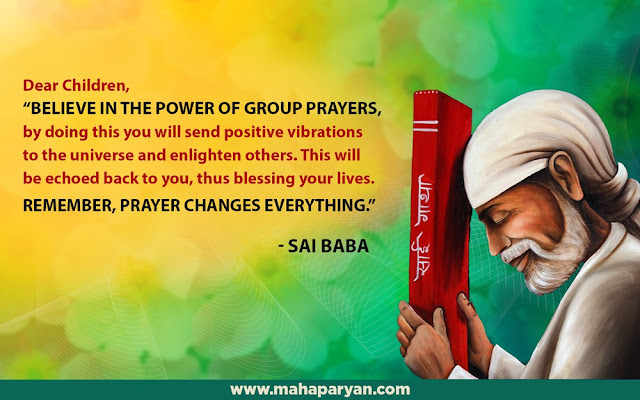 After many years, I got a message from Sai Baba through one of the Mahaparayan group members that, I should be a part of this group and resume my reading of the book like before. I made up my mind this time and became a part of this Mahaparayan group. I kept reading the experiences of people shared on the website and used to wonder if ever I will get to share some miracle which would happen during this Mahaparayan phase and here it goes. The miracle finally happened today i.e on 14th Dec 2017 (Thursday). My 7 year old daughter has her classical annual day programme tomorrow i.e on the 15th Dec at Sharjah, UAE and today was her stage rehearsal at the venue from 7.30 to 9.00 pm. We all were looking forward for this day when out of the blue, two days back i.e on the 12th Dec I received a letter from her school headmistress stating, she needs to attend an award ceremony in one of the schools in Dubai, as she had won the inter school drawing competition which was held couple of months back. Unfortunately, the award function was scheduled today i.e on the 14th Dec between 5.30 to 8.00 pm. My happiness knew no bounds when I came to know that she had won the 2nd place amongst the various schools participated but same time I was disappointed as her dance rehearsal and this award function was on the same day. Both the occasions were equally important for her and for us and we couldn't figure out how to be in both the places at the same time. We couldn't avoid the award function because she was representing her school neither we could skip her final rehearsal because she was supposed to get her costume that day and get familiar with the stage entry, exit and her position. When I spoke to her dance teacher, she said upfront that if we don't reach on time for dance rehearsal, then she cannot dance for the programme. It was not possible for us to reach Sharjah from Dubai keeping the weekend traffic in mind. Now the only option left was "Prayer". I started praying to Sai since yesterday and told Him to do some miracle so that my daughter gets to attend both the programmes today. Today being Thursday I did my regular weekly pooja and read the assigned chapters too from Satcharitra and kept hoping that something should workout for me. I also prayed to Sai that, if He solves my problem I shall post my experience on the website and miracle of miracles happened. Since my daughter fell sick with fever since wednesday evening, I sent my husband to that school to check if He can receive the prize on her behalf. He reached that school and he called me from there and said that, he was informed by watchman that the award function had been postponed to next week. Wonder of wonders, I couldn't believe my ears and cried in front of Sai and thanked Him to my heart’s content and now am sharing it with all of you. After today's incident, my belief in Him has strengthened and come what may, I shall always continue to serve Him. Our merciful Sai Maa, no mother’s Mamta(Maternal affection) can be as deep and great as our Sai Maa’s mamta. Thanks Sai for being our Baba and Maa. Can’t thank You enough ever. Love You Sai. Jai Ho Sai. Shirdi Sai Baba devotee Arivalaki Chandrasekar from India says: Sairam to all ! First I want to thank Baba for giving me an opportunity to be a part of this Mahaparayan and thanks to all the admins for their continuous effort and support from behind to all Sai devotees like me. 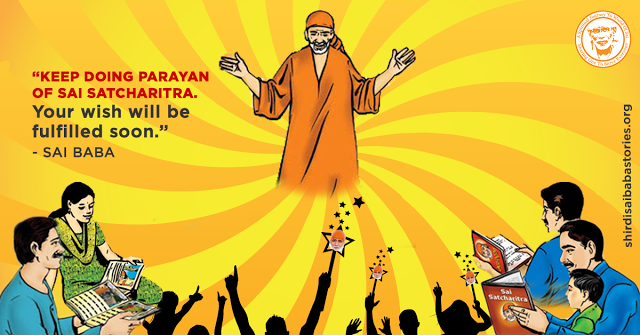 It's true that one's lifestyle and way of thinking changes after reading the Sai Satcharitra ! I too have experienced a lot of changes in my life after being a part of my MP-58 Arivalaki Sai group. Thank You Baba for giving me some responsibility in this big event. Miracles of Udi are all I know these days since I knew Baba. But after my Shirdi visit this year and making donation I was given some white powder packet which I saw for the first time and never got a chance to discuss about this with my friends but to my surprise - yes, that has made a miracle in my son's health. I didn't open it for few days as I am not sure what to do with it but kept on my pooja table near Baba. Later I read on our Mahaparayan blog that's it's a crushed sugar given by our Sansthan. After 2 weeks of our visit my 4 year kid suffered from throat infection. He had this infection twice before which was so severe, once during our U.S. trip and the other in India(both cases he was unable to swallow even his saliva and he was treated with heavy medicines and even hospitalised once) Again he was down with the same issue and I was not sure what to do and I got panicked. As usual I took him to hospital and started our antibiotic but he still had pain in his throat and he showed similar symptoms which made me worry that he might have to be hospitalised again as last time. I was praying Sai to give him relief from this and to my surprise changes happened. My son asked me to give Sai Baba sweet and he says Sai Baba sweet will cure me Amma. I was not sure if I can give it or not as doctor advised strictly no sweets or bakery products. Suddenly I remembered the story we read in Satcharitra chapter 13, with Baba's blessings even a substance that creates aggravation for some disorders have acted as medicines. So without any hesitation I trusted Baba and I prayed Sai to give him relief from this and gave him small pinch of crushed sugar as a medicine 3 times a day. Sai never fails us and approved my faith too as next morning my son was alright and he was back to school on Monday! (in 2 days he was alright but in last 2 cases we suffered more than 10 days in hospital). I couldn't thank God enough and today we both went to Special Pradhosam (Siva temple) which comes once in many years and was blessed by Lord Siva (Sai Himself ). I will always trust in Him as now and feel blessed ! Thank You Sai and once again thank you all admins for giving me an opportunity to pen His leelas . Sunthavada (White Sugar Prasad Packet is ginger powder mixed with sugar as Prasad prepared by Radhakrishnamaai during the Ram Navami festival. This prasad is mentioned in Chapter 6 of the Holy Sai Satcharitra. Baba’s ways are unique and beyond our intellect. Anything offered as prasad and eaten with faith can do us all good; no matter then what the prasad is! Love You Sai Maa. Jai Ho Sai! 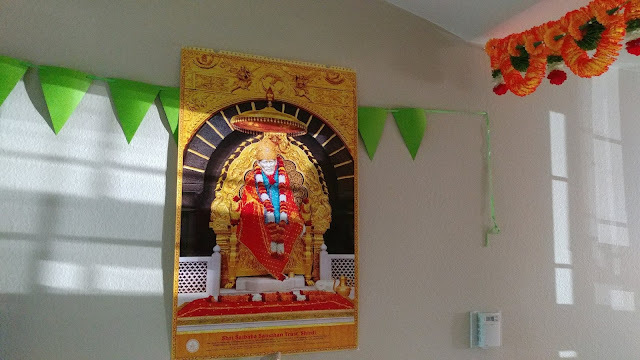 Shirdi Sai Baba Devotee Anupama Arora from Australia says: Om Sai Ram, This is Anupama from Melbourne, Australia. I am a very small devotee of Sai Maa. I just want to share our omniscient Baba Sai's beautiful leela. How Baba Showed His Presence In The Wild And Deserted Countryside Of South Australia And How He Made Just Boiled Rice And Daal As Very Scrumptious Khichadi And Also Made An Italian Couple Eat It Deliciously. Om Sai Ram to my precious Sai family I have been thinking of sharing this leela of our loving Sai Baba with you all. It happened when this Mahaparayan started, on the 30th of Sep 2017. We are left with no words when He lovingly plays His leelas in our lives. I was bit anxious when this Mahaparayan started (30th Sep'17) because my husband had planned a trip on 28th Sep '17 to Adelaide, South Australia via car (11 hours drive from my city, Melbourne ) We used to live in Adelaide before and have good friends there. Whenever we go there we live at my so called Italian mum's and her husband's house because she loves me just like as if I'm her own daughter. 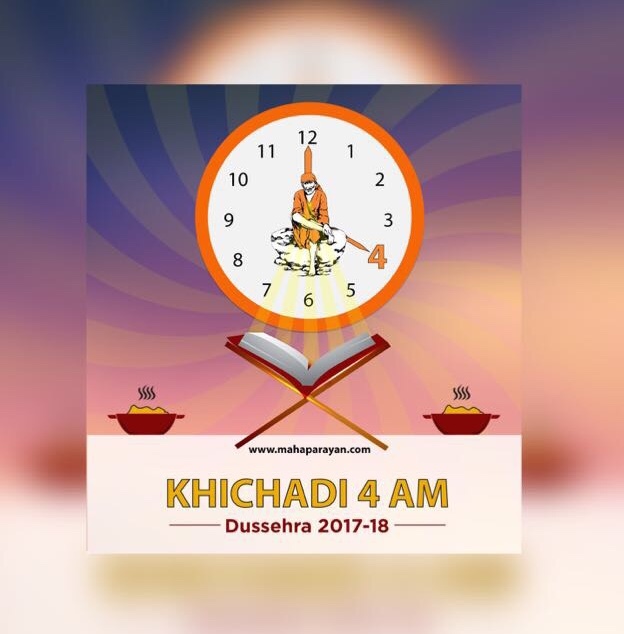 (I'll try to be short) While we were traveling I kept thinking that how will I start my Mahaparayan in her house and how will I make khichadi (as we have to offer khichadi as bhog for Brahma Muhrat Khichadi Parayan), how will I explain her about Mahaparayan etc? As we entered South Australia we stopped at a petrol pump. The outer area of South Australia is so quiet that you'll hardly see any person miles away. But Baba can reach anywhere and He did show His presence in such quiet place and telling me that He is always near me and don't be anxious about starting Mahaparayan and Khichadi Parayan all will be fine. As my husband went in to pay, I noticed there was just one car parked in front of us and the number plate was 'SAI'. I got goosebumps as it was least expected in that surrounding. We reached Adelaide on 28th then on 30th at 8 am (4 am IST) I went to a nearby park and read my chapters, with live darshan on ( pic attaching). I really wanted to make khichadi and offer but I wasn't sure if I'll be able to make in her kitchen as out of her love she doesn't let me work in the kitchen at all. Anyway somehow I managed to boil just rice and daal in a pan and added just salt and pepper, no ghee, no ginger or cashews no zeera. I thought who is going to eat this tasteless khichdi? I offered it to Baba and then mixed it back to the rest of the khichdi in the pan. At 12 noon we all sat down to have lunch. I was bit embarrassed to offer this tasteless khichadi to everyone. 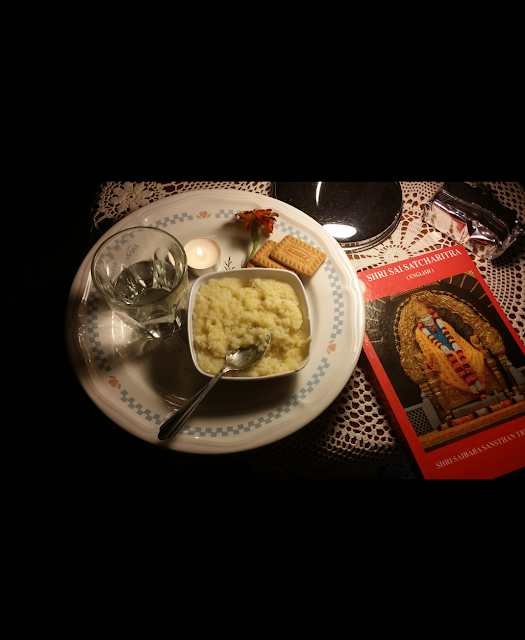 But anyway I served just 2-3 spoons of khichadi in bowls as prasad to my Italian mum and dad, my husband and my son. What happened next can you all imagine? I was pleasantly surprised and smiling at Baba and watching everyone eat. They all loved it so much (including my fussy eater son) that they all filled their bowls with khichdi in the second serve and all khichadi was finished only 2 spoons left which I gave it to birds. So Baba helped me start my khichadi parayan without any hindrance. I was so happy that I was able to make khichdi and everyone ate it (including the birds) and enjoyed it too! Is there anything impossible for our Baba Sai? Bolo Sadguru SaiNath Maharaj Ki Jai attaching pic of the first day of MP at my Italian mum's house, Adelaide). What to speak of Khichadi Parayan? It is the greatest of the miracles where every member has a story of how they got added miraculously and many amazing leelas have taken place about Baba’s acceptance of Khichadi. It was the love that you put in while making Khichadi for Baba which added the taste of bhakti to it. Even a small crumb offered with love, feeds Baba to His hearts Content and makes Him belch. Love You Sai. Jai Ho Sai. Shirdi Sai Baba devotee Priyanka Kapoor from India says: Om Sai Ram. I am very blessed to be writing this leela of Baba in the most unexpected time. I had a sudden car accident on a highway, when the roads were in bad condition. Our car skid and fell into a ditch which was 2 feet below the road, as well the car rolled over to the side. The entire accident happened in less than 10 seconds, but when I opened my eyes, I was fine! No lasting injuries! The first word I uttered after opening my eyes were " Sai Ram". I believe that this was truly Baba's way of saving my life, I was all fine, as if nothing had happened even though it was a big accident. I believe this is the good deeds of Mahaparayan that came back to me in this form. The prayers of thousands of devotees around the globe helped to save me. Just when the accident happened, a stranger came to help me, and made sure that I was taken care of and safe. She kept in touch with me even after 2 weeks to ensure my health and safety. When I thanked the lady, I said to her " Thank you so much, it's like you are an angel, and you are God sent". The lady then showed me her angel tattoo and her angel necklace. She said that her pet name at home is "angel". And at that moment, I was so sure that it was none other than Baba who sent an angel to save me. Thank You so much Baba, love You so much! Another experience is, I wanted to see Baba in my dream, - and I asked Baba and waited for almost 2 months but no Baba in my dream. Suddenly a few nights ago, I saw 3 images of Baba, one with Baba wearing green kafni - green might signify prosperity or blessings as green is good wishes. Baba in orange kafni, and Baba shining in orange colour. It felt so real, I got scared, I couldn't bear the dream and opened my eyes. It felt like some energy in my body. It's difficult to explain, but I'm happy that Baba had decided to visit me in my dream. Thank you for everything, to the entire team. I hope that my prayers in Mahaparayan will help everyone in the world with whatever difficulties they are facing. I pray that Baba will rescue each and every one of you. Thank you everyone for sincerely praying, and helping each other. Om Sai Ram . Baba’s Eyes are ever watchful on His Devotees. Very true when thousands of people across the globe reading for Mahaparayan it not only creates positive vibes on the globe and our surroundings but also creates a protective shield around us so that we are least affected due to any evil forces if any in the best possible way. 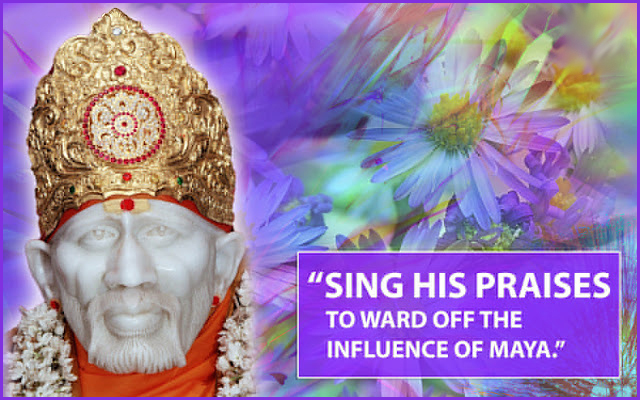 Thank You Baba for this wonderful gift of Mahaparayan and tying all the Sai Bandhus through common thread of Sai love. Love You Sai Maa. JAi Ho Sai…! Anonymous devotee of Shirdi Sai Baba from Singapore says: Jai Sai Ram, I would like to share the greatness of our Baba. First of all I would like to thank Poojaji, Hetalji and all the leaders and the members of the global Mahaparayan team. Baba bless you all in abundance. I could not see with one of my eyes for few months before the start of Mahaparayan on 30th Sept 2017. But I told Baba I still have one eye Baba and I will read for Mahaparayan. On 22nd September I saw the eye specialist and he told me that there was skin growth which blocks the vision. He suggested to do laser and gave me appointment for surgery on 25th Sept. His surgery for that day was full yet he gave me the first slot. Laser was done and he told me you should be able to read in few hours. In few hours I was able to read. My Baba wanted me to have both eyes ready for the Mahaparayan. I thank Him a lot. Another blessing is, I have a sister who stays in another country due to some misunderstanding, stopped communication with me and my siblings for about 10 years. Over the years we tried talking to her but failed. In the 3rd week of Mahaparayan I told my relative to get some information from her. The following week my sister called me and spoke very friendly. I was so amazed and thanked Baba alot. I know group prayers are powerful. I am experiencing little little miracles since the Mahaparayan started. Mahaparayan group prayer is very very powerful. Thank you all devotees of Mahaparayan. Poojaji special thanks to you the Founder of Mahaparayan. Om Sai Ram. In real sense Baba is the Founder of not only Mahaparayan but the entire Universe. I just feel too blessed and fortunate enough that the Master picked me up and gave the opportunity to be one of the instruments for Mahaparayan. Everything He does and Has His own Beautiful ways! On the path of devotion, what is needed is only and only pure love and surrender, then be rest assured that our Deva will carry us in His arms to cross this Worldly Ocean. Thank You Baba. Love You Loads. JAi Ho Sai…! 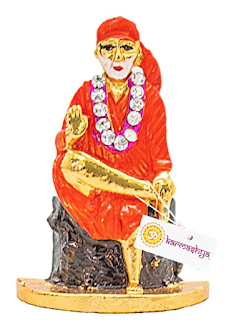 Shirdi Sai Baba Devotee Ria Ramani From India Says: My name is Ria, Jai Sai Ram! Thanks to Poojaji and Hetalji for all their hard work and efforts with the online portal which helps bring all Baba's devotees closer. By Baba's grace, I am writing and sharing this miracle that happen to us in last few months. With Baba's blessings, we started a small product company in 2008. Like every company, my husband worked very hard to build the product, hire and retain employees and establish the product in the marketplace. The company had some investors who invested and put in money to build the company. The company had more expenses than the profits. There came a time when they needed more money to survive. My husband started to look for more funding. The investors were not happy with that and kept waiting and hoping for a quick exit. The company had good potential and value which investors were aware off and so everyone hoped that company would sell soon and no more funding would be needed. The time when money would be exhausted came soon. There was dispute and disagreement in between the investors as to should they sell the company or shut the company down, which led to more trouble within the company. All were tensed and employees started to worry and many left the company. There were so much chaos, unpleasantness and no hope for the company. It came to a point where the only option left was shut down of the company. My husband proposed to reduce the employee workforce, modify the business model and take little funding to get the company off the ground. The investors did not agree and had lots of disagreement on what the next step for the company should be. Shirdi Sai Baba devotee Laxmi Kolli from India Says: Sai Ram, I am Laxmi, I am a small devotee of Lord Sai Baba. Baba has always been taking care of me and my family. This incident happened a day before 3rd parayan in Mahaparayan. That day was my telework day and my alarm went off at 5 am. I turned it off and slept again thinking that I could get up at 6 as I have to login to my work by 6:30. At around 5:30(This is the time usually I leave to work on the days I have to go to office) I felt like someone tapped on my shoulder twice. I thought it was my husband who was sleeping in next room and opened my eyes and no one was in the room. I got up and had my shower, relaxed for sometime and at 6:15 I was trying to login to my work computer (all this time I was thinking why I felt someone tapped on my shoulder and woke up) but I couldn't connect to my work computer, called help desk but had no luck and I had to go to my office. Once I reached my office and checked my emails I had an email from my director regarding a work issue which I was able to resolve easily as I was in the office. If I was working from home it could have taken double the time to resolve the issue. After all this happened I feel Baba was the One Who tapped on my shoulder and woke me up to attend the work issue. Thank You Baba. “Oh Bhagat Wake Up”, This is how Baba used to wake up Mhalsapati Ji. What more left to be assured and believe that with Mahaparayan Baba is actually living with us; just how He lived with His intimate devotees in Shirdi . Mahaparayan is a blessing in this Kaliyug. Thank You Baba for the nectar of Mahaparayan. Love You Saimaa. Jai Ho Sai. Shirdi Sai Baba devotee Bindu Thakkar from India Says: Om Sai Ram to dear Poojaji and all the members of our Sai family. Since last 12 days I was thinking of sharing my dream about Sai naam jaap but then I thought I am a smallest devotee, how can I compare my devotion with the devotees like Rakhiji, Poojaji or Archanaji. But by today's post Baba made me write my experience. As Centenary year is going on Shirdi Sai Sansthan is doing a wonderful seva for the Sai devotees by sending Baba's paduka in different cities. It's like Baba is coming to meet the devotees. There was a paduka darshan in my city on 7th and 8th January. I went to meet my Baba and really felt like Baba said if you are not coming to meet me, I am here to meet you. Shirdi Sai Baba devotee Jayanthi Venkatraman from Singapore Says: Om Sai Ram, I am Sai Devotee Jayanthi from MP 74 from Singapore. As a devotee of Baba, from the first day of the Mahaparayan every Thursday after my shower I sit in front of my home temple and read my chapters with all sincerity and devotion. Last December we planned our trip to India. My husband is asthmatic and since last 2 years he finds it very difficult to cope up with changes in weather conditions. In this trip we had plans to visit many places with different climatic conditions. On the day of reaching Mumbai, my husband started coughing very badly after getting up from sleep at night. I was disturbed by this and got up. I started worrying, how to manage the whole trip with such issues. All the bookings were made in advance. Shirdi Sai Baba devotee Krishna Priya from India Says: Sairam, I am Krishna Priya from MP-99 Swarna US group . 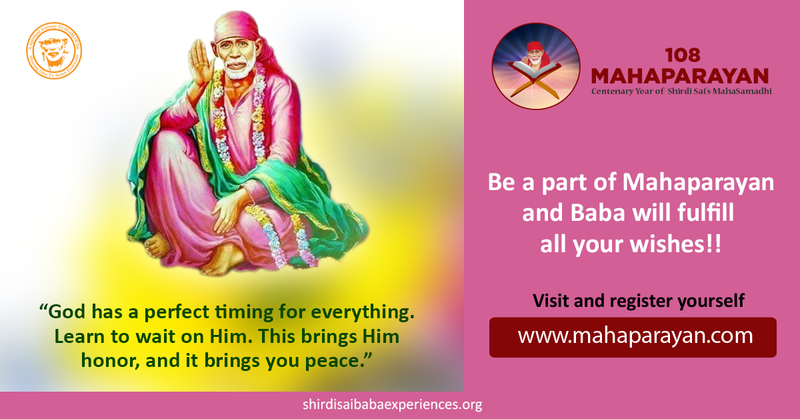 I have so many experiences with Baba , the one which I am going to share is the one which is much needed in my life. From mid November 2017 to December 21st 2017 I wasn’t sleeping, I used to be awake all the time . I tried everything from online for sleeping nothing helped. I visited doctor’s office for advice and my doctor told me to take some sleeping pills and relax my mind and usual suggestions that you can get from online also. I was feeling depressed, tired and lost interest in everything. I was praying to Baba every single day to give me proper sleep. I used to read devotees experiences who are doing Mahaparayan. I was waiting for my turn. Anonymous Devotee Of Shirdi Sai Baba from India Says: I am a part of Mahaparayan Group MP-57. I am Sai Devotee since 1995 and Baba has always helped me in every stage of my life. He has helped me and my family in every situation. I would like to share one of my experiences in the recent past. I am an employee at US Based Company and My husband runs his own business. On 6th December my husband had huge amount in our house which happened to be his friend’s amount which he was supposed to give him back on 7th December. Due to his absence in Bangalore my husband had to collect this amount from bank and had to handover it on 7th December. While on 6th December evening when we were counting the amount there was a shortage of 2 Lakhs which was missing and we were shocked to see this. Since this amount was collected from bank by my husband and was withdrawn on his friend’s behalf, it was his responsibility to give it with full responsibility. Now we searched entire house and bag and we could not find the 2 Lakhs which were missing. I prayed to Baba on Thursday morning before Parayana i.e. 7th December to Baba and left it to Him. If it’s our fate we will get the amount back else we will pay him. Since the amount was huge and without our fault this situation had come to us. I had complete faith on Baba thatHhe will surely help us but never knew when and how? Shirdi Sai Devotee Roopa Suresh from India Says: Sairam! Om Sai Ram,I am Roopa and want to share Baba's miracle for my husband’s health. We are Baba's devotee since 8 years. I was in great disastrous situation. My husband was diagnosed with a small tumor in his bladder in April 2014. Biopsy results said it was benign malignant. Later every 6 months we were getting tested but no recurrence. To our ill fate on 18th Nov 2017 he underwent cystoscopy where doctor identified small lesions and he suspected that it has repeated. He sent for biopsy expecting the results on 23rd November 2017 i.e. Thursday. Absolutely I and my husband lost ourselves. I wrote to this same blog (which were directed and published on the prayer blog) requesting all the devotees in this blog to please pray for my husband’s good health and that the results should come out negative and reports to be normal. It was devastating for the family. I pleaded to all my dear Sai brothers and sisters pray for my husband good health. Previously Baba had saved us from many difficulties. I just started Baba's nama japa the whole day to save my husband. 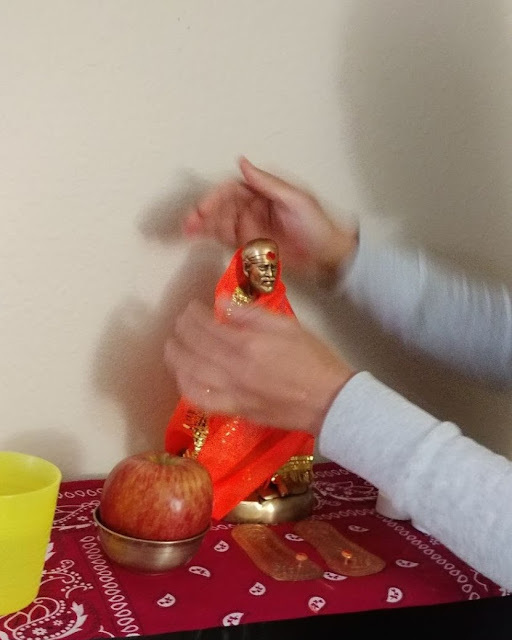 Anonymous Shirdi Sai Devotee From Malaysia says: Dear Ms Pooja Garg, Om Sai Ram. I wish to remain anonymous and I am from Malaysia and one of the member in the Mahaparayan group in Malaysia. First of all I am so blessed and thank Baba for choosing me in this Mahaparayan journey. Without His blessings and grace, I am sure that I could not have been part of this. Thank You Baba and thank you to you too Ms Pooja. Now, coming to my experience. Actually its about my son who is studying German A Level in Malaysia to get admission in German University. He was so excited to study in German and also decided to enter a University of his choice in Kassel, Germany which is one of the best Universities. He has put all the effort in his study to score good marks and yes, he did score excellent marks in his first level exam.